Designed and manufactured in the USA these units maximise quality, reliability, accuracy and ease-of-use. Externally, the unit is coated in a tactile, black rubberised paint to maximise grip. The red dot aiming system, visible only through the bright, clear viewfinder, offers a very accurate point for taking readings. A single button maximises ease-of-use and allows you to programme the unit to read in feet, yards or metres. All readings are read out on an LCD situated just to the right of the optical viewfinder. 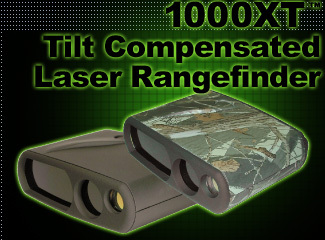 Also available ----- Optionally , the unit is coated in a tactile, Realtree® Hardwood camouflage paint. 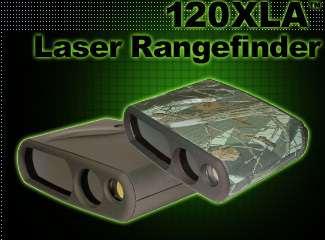 Utilising an Infrared Class 1, eye-safe 905nm laser, the unit is accurate to ± 1 yard/metre (± 0.5 yard/metre on typical targets) and has a minimum range of just 4 yards/metres. An automatic rain mode minimises the risk of inaccurate readings in inclement weather. The unit is configurable for silent 'Stealth' or audible 'Chirp' mode. Maximum range is 200 yards from a non-reflective target up to 500 yards on a highly reflective one. Power is supplied by 1 x 9V PP3-type Alkaline battery (not included) which operates for approximately 1000 readings. Externally, the unit is coated in a tactile, black rubberised paint to maximise grip. (Or camouflage) The red dot aiming system, visible only through the bright, clear viewfinder, offers a very accurate point for taking readings. A single button maximises ease-of-use and allows you to programme the unit to read in feet, yards or metres. All readings are read out on an LCD situated just to the right of the optical viewfinder. Maximum range is 600 yards from a non-reflective target up to 999 yards on a highly reflective one. Power is supplied by 1 x 9V PP3-type Alkaline battery (not included) which operates for approximately 1000 readings. Maximum range is 1000 yards from a non-reflective target up to 1500 yards on a highly reflective one. Power is supplied by 1 x 9V PP3-type Alkaline battery (not included) which operates for approximately 1000 readings. Externally, the unit is coated in a tactile, black rubberised paint to maximise grip. (Or camourflage) The red dot aiming system, visible only through the bright, clear viewfinder, offers a very accurate point for taking readings. A single button maximises ease-of-use and allows you to programme the unit to read in feet, yards or metres. All readings are read out on an LCD situated just to the right of the optical viewfinder. Utilising an Infrared Class 1, eye-safe 905nm laser, the unit is accurate to ± 1 yard/metre (± 0.5 yard/metre on typical targets) and has a minimum range of just 4 yards/metres. An automatic rain mode minimises the risk of inaccurate readings in inclement weather. The unit is factory configured for silent 'Stealth' mode. As well as straight Line-of-Sight readings, the XT Series also calculate the Tilt-Compensated, or true horizontal, distance. They calculate corrections automatically for any angle up or down hill for ultimate accuracy. Utilising an Infrared Class 1, eye-safe 905nm laser, the unit is accurate to ± 1 yard/metre (± 0.5 yard/metre on typical targets) and has a minimum range of just 4 yards/metres. An automatic rain mode minimises the risk of inaccurate readings in inclement weather. The unit is factory configured for audible 'Chirp' mode. As well as straight Line-of-Sight readings, the LH Series also calculate the Tilt-Compensated, or true horizontal, distance. They calculate corrections automatically for any angle up or down hill for ultimate accuracy. 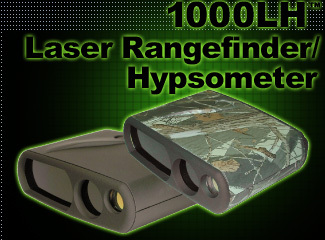 LH models also have a built-in Hypsometer that measures the height of an object with an accuracy of ± 18 inches. They also measure the incline to an object in either degrees of angle or percentage gradient.